The long wait for 2017 Gladfield Rye malt is now over, this week we have finished kilning this malt and we are happy how the Rye has performed in the malt house. This year all our R ye will come from a single farm, actually from a single paddock! In this article we will talk about how Haldon Pastures manage to grow such great quality Rye and the decision making behind growing this crop. Why you should consider using Rye on your next brew and we will also share some recipes with you for autumn brewing inspirations. John and Hilary Grigg with their 3 kids (Jack, Hamish and Eliza) own Haldon Pastures an 844 hectare farm located close to Darfield, Canterbury. The Grigg family grows cereals, small seeds like carrots, and also run breeding ewes and dairy grazers. Mr Grigg says that good decisions when growing Rye is important. Sheltered paddocks are the best because Rye crops grow very tall (most of the time higher than Gabi!) and with strong winds the crop can fall over making it hard to harvest. Having their own dryer gives the Grigg family the X factor specially when growing Rye corn. We asked Mr Grigg why the dryer is so important. He said because Rye is a grain that germinates very easy, the dormancy period in this grain is very short and sometimes none at all. When barley for example takes up to 2 months to germinate after harvest. Rye on the other hand if the conditions are right will sprout easily while still in the plant. If this happens it has no use at all for malting, so the dryer allows Mr Grigg to harvest the Rye before it germinates in the paddock even when conditions are not right for harvesting. Rye is drilled in April/May and harvested in February/March. Why should you consider using Rye on your next brew? Rye is unique and if you want to get people to talk about your beers, sometimes, using unique ingredients will come a long way for you to achieve that. Rye beers tend to have a nice head and an interesting grainy, slightly spicy flavour, light bodied and somewhat dry. Rye like Wheat has no husk, if use in high quantities you could encounter stuck mashes or slow run offs. Recommended usage rate is 10 – 20%, if you want to brew using higher percentages it may be necessary to aid the filtering using Oat Hulls or Rice Hulls. 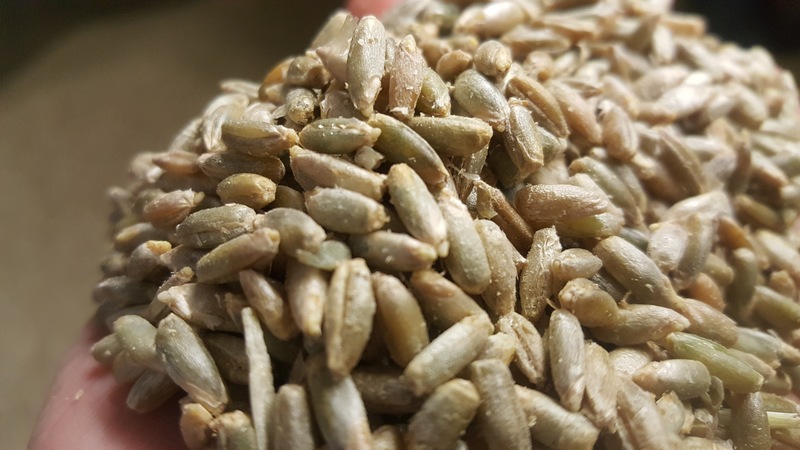 Avoid combining rye with raw barley; raw barley also has high levels of beta-glucans, and this could make for an extremely sticky combination. Here at Gladfield we have never used Rye that has had such good quality and we commend the Grigg family for an outstanding performance in growing this crop for us to malt. Gladfield Malt is proud to associate with growers like John and Hilary who respect their land and work hard and proactively to produce outstanding quality grains such as the Rye. We have been busy developing some Rye recipes for you to try, and you can find them below. If you want to discuss any of these recipes with us, please don’t hesitate to contact us here. Next time you open a bag of Gladfield Rye, take a moment to contemplate on how hard it is to grow this crop and how much time and dedication goes into making sure the Rye will make good quality malt and an award winning beer. 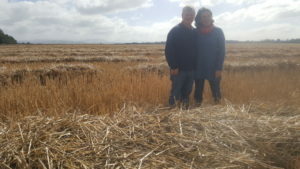 John and Hilary Grigg and a paddock of stubble where 2017 Rye crop was grown and harvested. 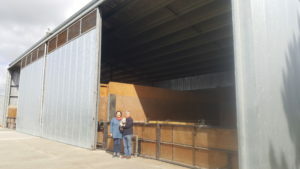 Hilary and John Grigg in front of their grain drying facilities at Haldon Pastures. 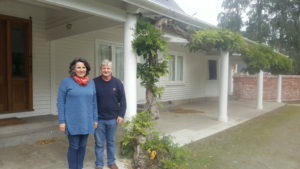 Hilary and John Grigg, dedicated Rye growers in front of Haldon Pastures Homestead. Blog written by Gabi Michael, co owner of Gladfield Malt.